My father purchased the cheapest cars in the paper for me. It was far better than the auto union DKW it replaced. I REALLY DO NOT MISS THE CARS OF THE SIXTIES! OT. Oddly enough, the first BEV conversion I ever saw was a red Karmann Ghia, back in the early '90s when I was selling off-grid systems. One of my customers had it and had done the conversion, so I asked him all about it. He used it for his daily commutes in the Bay Area, I think 25 miles but I don't remember if that was one-way or round trip. IIRR it was a hardtop so probably this isn't the same car, but Karmann Ghias were popular BEV conversions owing to the space front and rear for batteries; ISTR Corvairs (and 914s) were popular for the same reason. I don't remember for sure, but think he may have worked at Lawrence Livermore or Sandia (one of whose boundary streets is Tesla Rd.). Re aesthetics, while some of the '60s and '70s cars were really bad (I personally loathe the Rover sedans and their side overhangs, and the Mirai's jowls remind me of them), I maintain that the ugliest car currently available in the U.S. is a Nissan Juke. 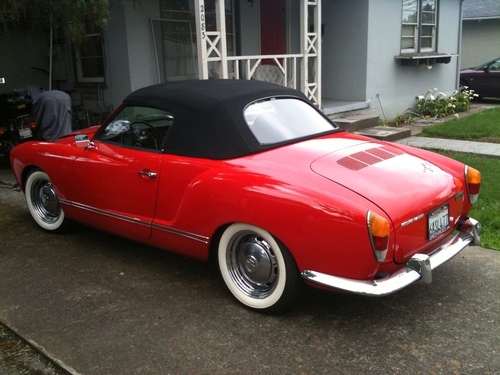 I thought the Karmann Ghia was okay (certainly better looking than the 914). Per IEVS, January U.S. sales of the Mirai were 213, up 146.4% YoY from 83 in 2017. Geez, look what’s happening in diamond bar live right now!! A hydrogen fuel transport truck EXPLODED and they had to evacuate the whole surrounding area. 13kw Enphase System,SolarWorld Panels, QuickMountPV- ALL USA!! JasonA wrote: Geez, look what’s happening in diamond bar live right now!! A hydrogen fuel transport truck EXPLODED and they had to evacuate the whole surrounding area. Jason, while I agree Hydrogen is foolish in terms of passenger vehicles, your use of “EXPLODED” is click bait. According to the first link, there was no explosion. That said, there are transportation, storage, energy inefficiencies, and other factors with hydrogen that do need to be addressed. It did explode and catch fire. Witnesses say it rocked homes many blocks away. So Hazmat did their job VERY well which means fuel cells are ok?